J F ARTHUR ESQ. M.D. C.S.I. Surgeon Major John Findlay Arthur, C.S.I. John Findlay Arthur was the eldest of five children of David Arthur and Jane Findlay. He was born at Crook and, a small cottage on the lands of Wellhill that was later farmed by his father. His brother William (b.1809) was also born at Crook while siblings Margaret (b.1811), David (1813) and James (b.1816) were all born at Wellhill. A life on the farm was not for John and he went to the University of Glasgow to study medicine. His university records show that the he graduated as a Doctor in Medicine in 1831 and as a Master of Surgery five years later . Now 29 years old John entered service as an assistant surgeon with the Indian Medical Service (IMS) at Madras on 14th February 1936 and was promoted to surgeon on 29th October 1852 . The year before he had been living at Dundas Street, Edinburgh as a lodger at the home of Robert Cockburn, Master Coal Dealer when Arthur’s occupation in the Census 1851 is given as Physician Glasgow Indian Army. On the 10th May 1857 mutiny of some Indian soldiers (sepoys) at the garrison town of Meertut some 40 miles north of Delhi sparked off what became known as the Indian Mutiny or Rebellion (1857-1859). By the end of June the rebel forces were laying siege to the British Residency at Lucknow. Surgeon John Findlay Arthur served with the 1st Madras Fusiliers as part the 1st Relief Force and then again in the siege and capture of Lucknow in March of the following year. John retired from the service with the rank of Surgeon-Major on 29th February 1860. “The Queen, being desirous of affording to the Princes, Chiefs and People of the Indian Empire, a public and signal testimony of Her regard, by the Institution of an Order of knighthood, whereby Her resolution to take upon Herself the Government of the Territories in India may be commemorated, and by which Her Majesty may be enabled to reward conspicuous merit and loyalty, has been graciously pleased, by Letters Patent under the Great Seal of the United Kingdom of Great Britain and Ireland, to institute, erect, constitute, and create, an Order of Knighthood, to be known by, and have for ever hereafter, the name, style, and designation, of “The Most Exalted Order of the Star of India”  . The Order includes members of three classes Knight Grand Commander (GCSI), Knight Commande (KCSI) and Companion (CSI). In June 1869 John Findlay Arthur’s service in India was recognised with the honour of ‘The Most Ealted Order of the Star of India’, CSI. By 1875, John Findlay Arthur C.S.I. has returned to New Cumnock and is living at Lochside House, then owned by the Marquis of Bute and previously used as a shooting lodge. J F Arthur later acquired Lochside House and the associated offices which was also home to his dometic servants, coachman and gamekeeper. 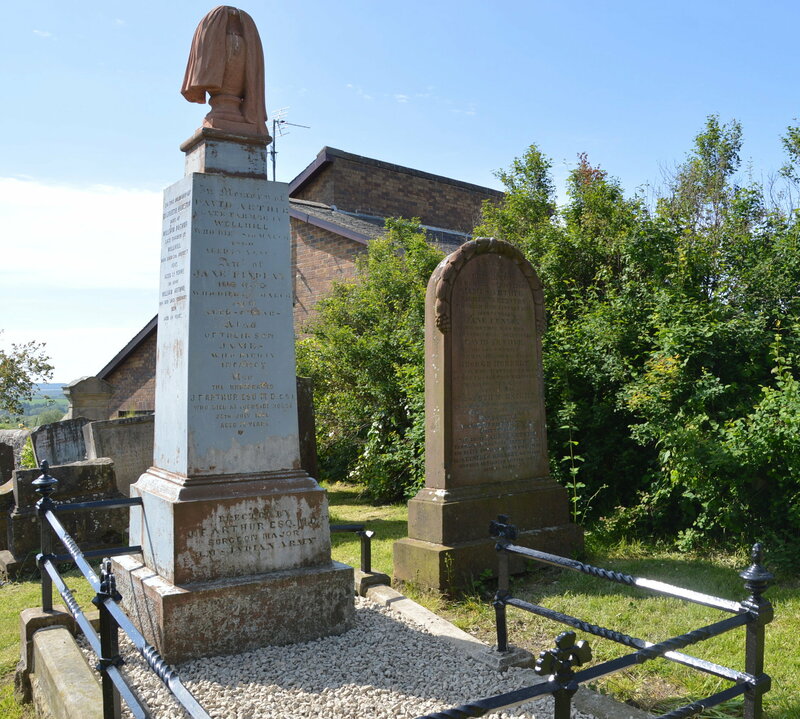 It was at Lochside House that he died on 26th July 1886, aged 79 years and lies in the family plot in the Auld Kirkyard.